Previous image, 35 total items. Next image, 35 total items. It has never been easier to save with Mooloolaba holiday packages on Expedia. You'll have plenty more time to sort out the fun stuff — and more cash to splash! By booking a package deal on Expedia, you can save up to $200*. There's no need for you to look through different websites to secure your travel bookings. With more than 400 partner airlines and 321 000 properties around the world, our global database has all that you need. If you have to change your travel plans, we'll honour your cancellation request on almost all reservations with no hidden fees. Feeling excited about your trip to Mooloolaba? After a few hints about what to see when you get there? That's where we can help! We're all fond of our furry and fuzzy friends, but how about getting acquainted with those who can be a tad more slippery and scaly? Encounter a few of the most fascinating occupants of the underwater realm at SEA LIFE Sunshine Coast. Still got time to spare? In the mood for a picturesque evening on the shoreline? Bring a picnic rug and find the best spot to drink in a stunning ocean sunset at Mooloolaba Beach. Throw yourself into all there is to see and do and head home with the greatest souvenir of all — fond memories of your marvellous trip! Take a look at our Mooloolaba things to do page for a full list of activities. 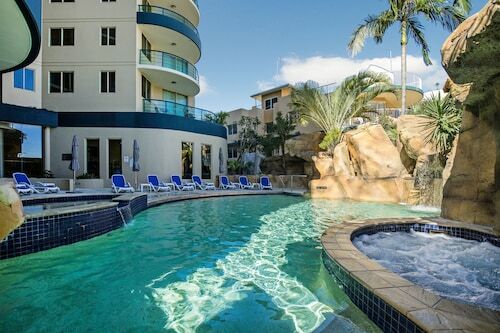 Whatever kind of accommodations you're searching for, Mooloolaba has you sorted. With 55 options to pick from, you're sure to find one that's ideal for your luxury getaway or cheap holiday. You'll have the chance to experience the neighbourhood from a comfortable base should you choose to stay at the Oceans Mooloolaba (101 - 105 Mooloolaba Esplanade) or the Sea Pearl Resort Mooloolaba (87 Mooloolaba Esplanade). 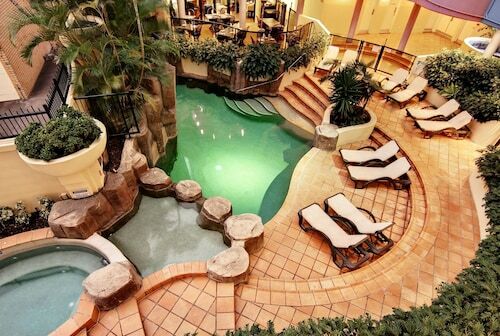 Preparing for your trip to Mooloolaba? Planing to fly in? Prepare to be welcomed by a crowd of smiling faces at Brisbane Airport (BNE). It's located 50 miles (80 km) south of the town centre. Watch seals play with their trainers, sharks swim above your head and dolphins jump out of the water at this award-winning marine park. Cool off in the water, stroll along the coastal esplanade and scuba dive among military shipwrecks. Relax at one of the Sunshine Coast’s most attractive beaches, where fishing is abundant, the surf is great and the rolling waves are perfect for swimming. Walk along the waterfront, have a barbecue on the grassy parklands, let the kids enjoy the playground and shop in the boutique shops after a swim in the ocean. Take in sweeping views over the land and sea, walk along the beach or just relax in the sun on this slice of land between river and sea. Situated in Mooloolaba, this luxury aparthotel is steps from Mooloolaba Esplanade and Mooloolaba Beach. SEA LIFE Sunshine Coast and Maroochydore Beach are also within 2 mi (3 km). 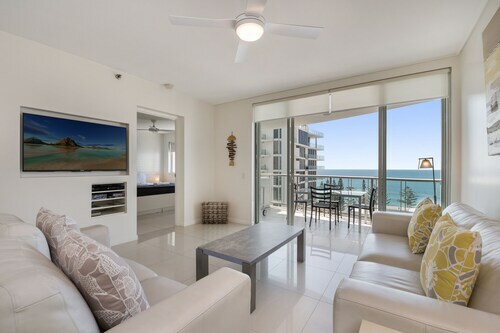 Located in the heart of Mooloolaba, this luxury apartment building is within a 5-minute walk of Mooloolaba Beach and SEA LIFE Sunshine Coast. 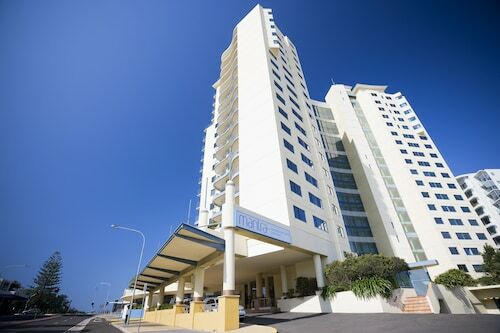 Situated near the airport, this hotel is within a 10-minute walk of Mooloolaba Beach and SEA LIFE Sunshine Coast. Headland Golf Club and Sunshine Plaza are also within 3 mi (5 km). 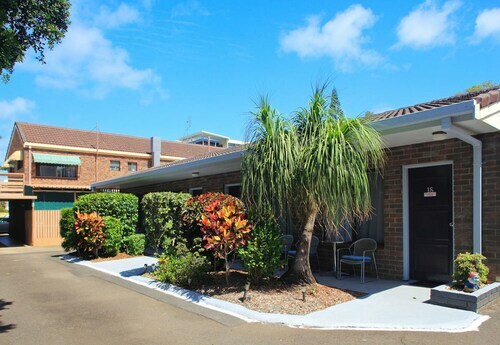 Located in the heart of Mooloolaba, this motel is within a 10-minute walk of Mooloolaba Beach and SEA LIFE Sunshine Coast. 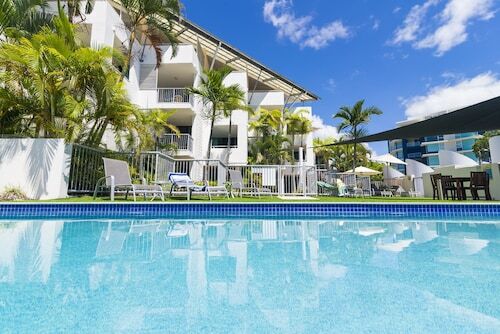 Located in the heart of Mooloolaba, this apartment building is steps from SEA LIFE Sunshine Coast and Mooloolaba Beach. Kawana Beach and Maroochydore Beach are also within 3 mi (5 km). Situated near the airport, this apartment building is within a 10-minute walk of Mooloolaba Esplanade and Mooloolaba Beach. SEA LIFE Sunshine Coast and Sunshine Plaza are also within 3 mi (5 km). 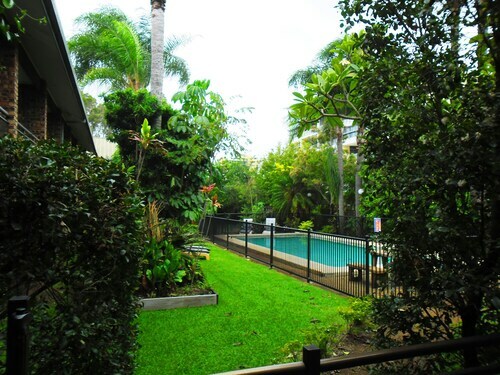 Located in the heart of Mooloolaba, this apartment building is within a 10-minute walk of Mooloolaba Beach and SEA LIFE Sunshine Coast. Kawana Beach and Maroochydore Beach are also within 3 mi (5 km).